Our Etienne console table is a perfect piece for any hallway or living room with ample storage space and a traditional chic design. 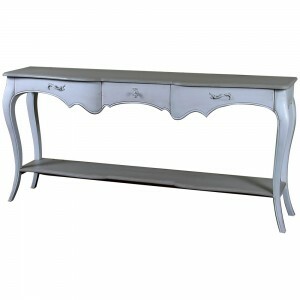 The console table features 3 drawers complete with stylish metal drop handles and sits upon four gently curved legs. This table has a heavy distressed turquoise finish and works well with other French furniture as a contrast piece or part of the same collection of Etienne. A heavy distressed painted finish, again based on classical antique designs with an eclectic mix of Blue/Green, bordering on Turquoise. This collection is certainly a conversation point.